Pay with credit card or via bank transfer. Speak German? Please check PayPal explained - Auf Deutsch. In February 2010 Cacina and I were part of a magical trip with Crimson Circle through Egypt. Throughout our journey with a group of 100 participants we were toning together and listening to Geoffrey Hoppe's channeling at many sacred sites. The music on this album was created using excerpts from the events on this amazing trip. Except for the bonus track "Al-Khem My Love" all pieces include parts of various live recordings from on-site channelings, and group tonings in magical Egypt... in ancient times known as "Al-Khem". We are inside the Great Pyramid, one of the most significant constructions on this planet Earth, aligned with the stars in ways we are just now beginning to fathom. Ah-Kir-Rah's timeless words and tones echo from the ancient walls. The sound in this place is literally out of this world. This is the experience put into music. Early morning in the temple of Karnak. Silently we stand in awe. Still profoundly touched by our magical visit with the goddess Sekhmet, we begin to tone in the first rays of the sun. The beautiful sound of the birds fills the air and occasionally you hear a distant bark from one of the temple dogs. Just close your eyes and allow the music to take you there. We had just visited the famous Sphinx when Mr. Hassan Khalil, our amazing egyptologist and tour guide, took Cacina and me aside to point out the meaning of specific hieroglyphs at the very portal we were standing at. We were so taken by his knowledge and passion for these messages as he told us: "Make music of it! It has vibration." And so we did. "Ntr Nfr" is the music we made using these sacred, ancient Egyptian messages of love and heart. It was the last evening on our beloved river boat. Floating down the Nile, Adamus gave one of his most beautiful and inspiring channelings ever. When he talked about the Atlantean Dream we all were touched to tears. This piece contains the essence of this precious evening in words and music. During our time on the Nile our big group gathered on several occasions for toning and singing. The song we enjoyed to sing the most was our "Song Of The Nile" - Sja Va Na. What you can hear in this piece contains parts of the very recording that was made on Gallabya night when the entire group sang their "Sja Va Na" in the round centre hall of the boat. It's all there – the many voices, the joyous "live" energy, the deep humm from the boat, and even the cheerful applause at the end. This piece does not contain any live recordings from our journey. The song came to me right after our return from Egypt. One day I just began singing from a part within me I didn't even know I had. Allowing my voice to go where it wanted to evoke an ancient memory and a longing for something I once knew so well… my Al-Khem. “Oh-Be-Ahn is a stunning collaboration between Ah Kir Rah, Adamus and Shaumbra, magically woven together and profoundly enhanced by the musical mastery of Anders Holte. 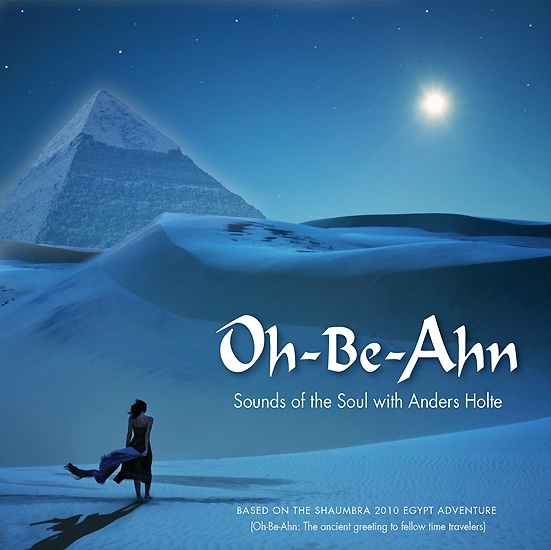 The tracks featured on this CD began with recordings from 2010 Shaumbra Egypt tour "Sounds of the Soul". These recordings include toning in the temples, channeling in the Great Pyramid, and more. Excerpts from these recordings were then audio mastered and layered with the profound beauty of Anders’ voice, rhythm and song. IT IS AMAZING THE WAY MY OWN SOUL TALKS TO ME THROUGH YOUR TUNES AND VOICE… especially YOUR VOICE !! JUST AMAZING. The old Egyptian in “Ntr Nfr” was right: there is vibration in it, but MUCH MORE than that! “My english is not good in writing. I just find you on the internet. I didnt hear all of your music yet. Ive heard some tracks sample: “Lemurian Home Coming”, “This is the Place” (beautiful! ), “Morning with Sekhmet” (wonderful! ), “Atlantean Dream”, “Sja Va Na” (wonderful too!). They were short but your voice is wonderful! I thought that I was hearing an amerindian native or someone like that singing (because of the caliber of your voice and those unknowned words). I didnt expect a danish one! After I listened your music I felt the need to write to you to tell you that this kind of music is so perfect to your voice! I think that you should sing more like that.